May be served over cooked rice or noodles. Combine ingredients for Meat Marinade. 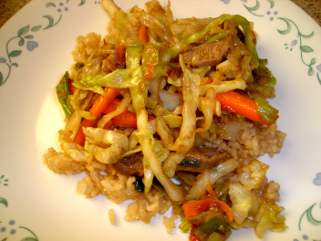 Cut meat into 1/2 inch strips as for stir fry, a little thinner if using round steak. Be sure to cut across the grain, to avoid toughness. Put the meat into the Marinade for 30 minutes. Be sure all the meat is covered. After the 30 minutes, put 1-2 Tablespoons oil in pan or wok and when it is heated enough, add the beef strips. Cook until nearly done, about 7-9 minutes. When meat is nearly cooked, remove it to a bowl. I usually wipe the pan with a paper towel at this point, and start with fresh oil for the vegetables. While oil is heating, put the sauce together. Add the corn starch last, after the rest is already well blended. Stir fry the garlic and ginger until just aromatic. Add carrot sticks, then white part of onions. If using zuchinni, add it next. Stir fry about 2 minutes and then add cabbage. 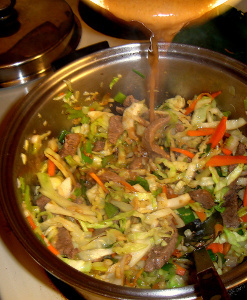 When the cabbage is softened, add the meat back in and mix. 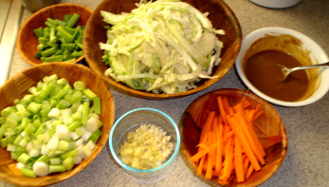 Then add the bean sprouts, if using, and the green part of the onions. Stir fry about 1 minute. Add the sauce, and allow it to come to a boil for about 1 minute. The sauce should be thick like gravy and cling to the food. Serve over rice or noodles. We find this gluten free recipe very tasty, and I hope you will too. Try the 1/4 tsp red pepper flakes the first time unless you want it spicier. (The pictures have a double recipe) If you are just starting to heal you can omit the red pepper flakes until you are ready for a spicier meal.